Last month I had the opportunity to attend the 3rd Multidisciplinary meeting for Universe Awareness at the Lorentz centre in Leiden, Netherlands. I attended the 2nd meeting in 2006 and some of the old faces were there . The great thing about Leiden is the amount of gorgeous restaurants available dotted around the town centre. 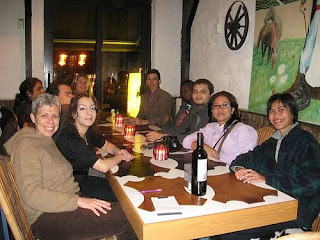 Here we are at the Argentinian steak house which was the choice of our Columbian friends, they made a good choice! UNAWE UK currently exists as a pilot project based in Greater Manchester schools but as UK Coordinator the next few weeks will see plans to roll this out nationwide materialise. The BA are very keen to have astronomy themed projects for young investigators and CREST Awards avaialble for IYA 09 and this is something I am currently developing to encourage school children from 5 years old up to participate in school. If I had the opportunity to do that when I was 5 I would have been well chuffed! On a serious note engaging pupils in STEM from an early age will give children the opportunity to develop their skills and keep their interest in science alive during that transitionary period between primary and secondary school. The comparison of statistics of students going into STEM careers in Britain, and many of the G8 nations compared to India and China makes fascinating reading. With a drop out rate larger than most nations is it any wonder pupils are choosing other careers when there is practically no visibility for STEM related jobs? Gone are the days when we had a science minister migrating from a STEM Background. Careers and visibility of routes into STEM jobs will be something that as a collective the Space Education Council hopes to tackle http://www.spaceconference.org.uk/ Check out the draft programme available now online for the careers day. Saturday at the conference will see the final of the UKAYRoC competition, a few weeks back we had some amusing catastophes with two Bolton based schools. The aim is to launch two raw hens eggs to a height of 700 feet and to guide these safely down to then enter the final. Unfortunately both rockets with altimeters attached ended up as mushy cardboard spattered on the ground after impacting at speed with the asphalt, tip - make sure you invest in decent parachutes if attempting to enter for next year! Thank goodness the winds were blowing in the right direction on this day, the testing grounds of Bolton TIC are right next to Bolton Royal Infirmary. Perhaps scrambled egg and cardboard could be a new menu item? One of the rockets very nearly headed for a hospital ward window! 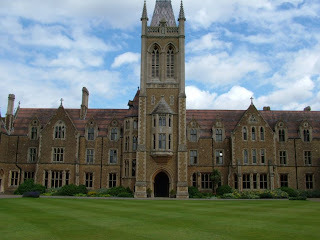 Next week will see the launch of the UK Space Conference which takes place at Charterhouse in Surrey from Thursday 27th March to Saturday 29th March. I'm really looking forward to this as I will be presenting a session there on the Friday aftenoon representing the Association for Astronomy Education. More about this later!